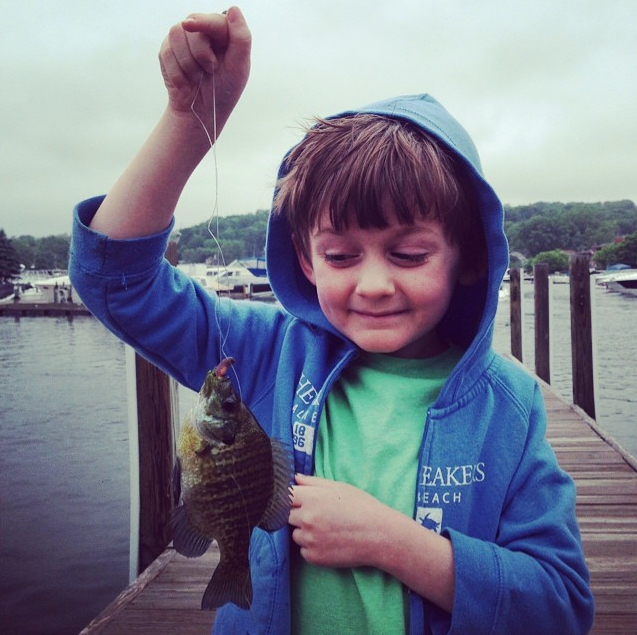 My six-year-old boy just caught a fish. 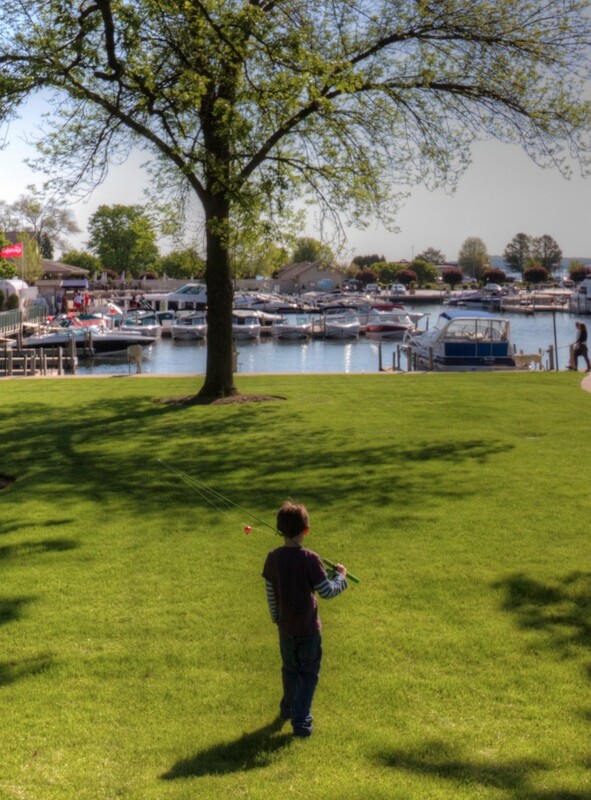 We’re standing where the edge of the green lawn meets the boat docks on Lake Geneva at The Abbey Resort and, after only a few minutes of casting, a nervy sunfish has brazenly decided to try to make off with his bait. After a furious battle, my son reels the creature in and lifts it into the air to admire it, the first of half a dozen that we will catch that afternoon. He’s acting like he just won the lottery, laughing and wondering at the thing. For a second, we just stand there and catch our breath, not speaking, just grinning at each other and admiring it. We had a moment. For him, it was all newness and exhilaration, looking to me to share it with him; for me, it was a moment of transference, remembering a very similar moment when I was the child holding up the prize to my late father while, in that moment, he surely must have felt the presence of his own dad. An echo upon an echo. Such a simple thing. But I’ll always remember it. And so will he, on that distant day when he stands where I stood, and sees what I saw, and makes a connection with his own child. 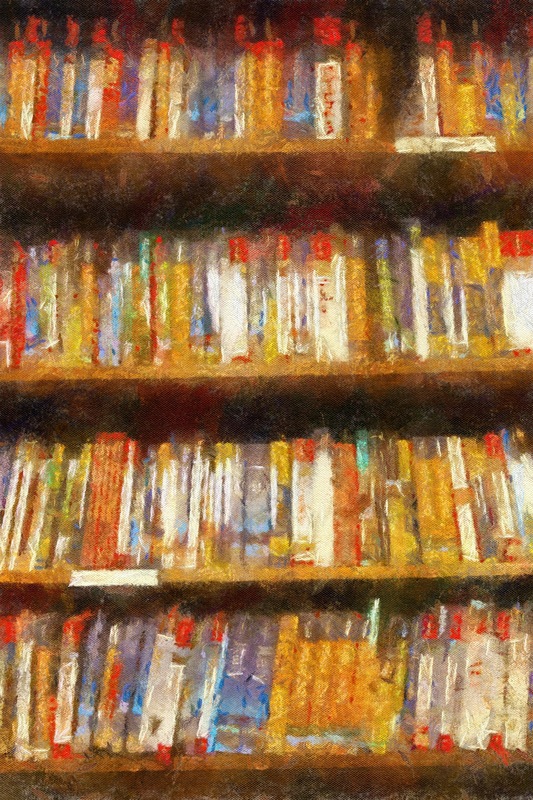 The best vacations are often made up of a collection of little episodes like this, these elusive little momentary connections that are highlighted in our memories. But there’s a trick to it. You can’t force them. You can, however, invite them, by creating a clearing in your life with enough room and time to allow them to happen. The Abbey Resort and Avani Spa on Lake Geneva has long been a place where you can have the opportunity to spark such elusive moments. The Abbey is aptly named. It truly is a retreat; its 90 acres removed from even the modest bustle of the little lakeside villages that dot the shores of Lake Geneva; sheltered in it’s forested crook of the lake with its sleepy boat dock; its high A-frame central structure standing against the sky like prayerful hands; inviting the weary to come and find sanctuary for awhile. Earlier this summer, feeling weary, we gratefully accepted. Poised halfway between Chicago and Milwaukee, the Abbey Resort lies on the shores of Lake Geneva, Wisconsin, but is in neighboring Fontana and not the actual town of Lake Geneva, This is altogether to the good. The town of Lake Geneva is charming and well worth a visit, but sometimes total escape is what you crave. For us, on this trip, it was, and we loved being sequestered within the Abbey’s sprawling green confines while still having the closeness of downtown Geneva available to us should we feel the need. The design of The Abbey lies somewhere at the intersection of elegant hotel and alpine lodge, with quiet, well-appointed rooms, many with lake views. The rooms on the second floor have high, vaulted ceilings that echo the posh/rustic feeling of the lobby and dining areas. Built in 1963, the 334-room resort was given an extensive renovation in 2005, adding the Avani Spa in 2008, which was itself further expanded, and in 2014 it completed the final phase of its 50-million-dollar reinvention. Despite it’s size, the Abbey manages to always seem intimate, never too large, always unfolding as you turn the corner to continue your explorations. The Atrium Pool at the Avani Spa at the Abbey Resort. 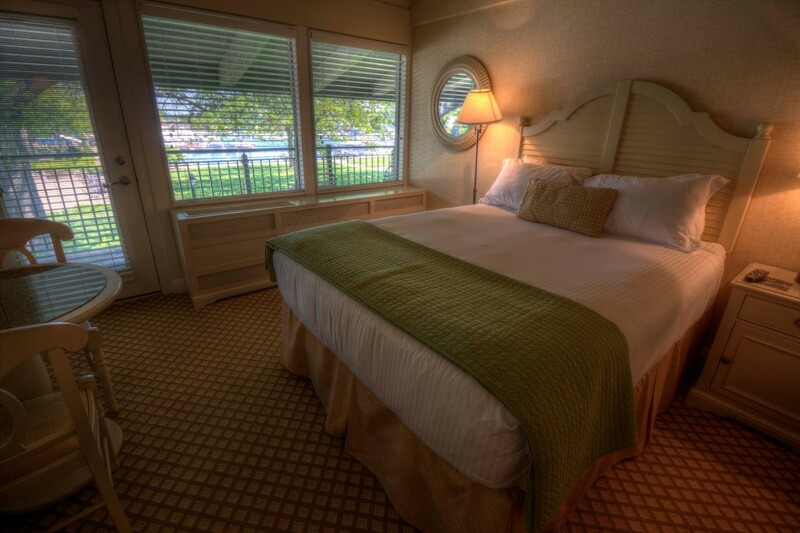 Photo courtesy of The Abbey Resort & Avani Spa. While my son and I were fishing, my wife, never one to get within a mile of putting a worm on a hook, was pursuing her own special moment at the Abbey’s very special Avani Spa. My wife, it has to be said, is kind of a snob more than a little discerning when it comes to therapeutic massages and other spa treatments. We’ve been fortunate enough to have some truly transcendent experiences in the past at exotic spas all over the world and so we’re both, well, kind of spoiled. But she raved about her golden afternoon at the Abbey Spa, particularly her massage therapy. I paid the spa a visit myself the next day and had my own turn on the table, and it was every bit as good as she reported. The Avani Spa is newly remodeled and, at 35,000 square feet, is the largest spa in Lake Geneva. Wellness amenities include a full-service salon, a state-of-the-art fitness center, saunas, steam and inhalation rooms, and a tantalizing menu of treatment options including wraps, facials, mani-pedis, and a plethora of creative massage experiences. At any spa, however, the most important aspect of the experience is the talent and sensitivity of the therapist and, here again, the Avani Spa excels. The massage therapists that administered our treatments were highly skilled and individual in their ministrations—no one-size-fits-all massage approaches here. 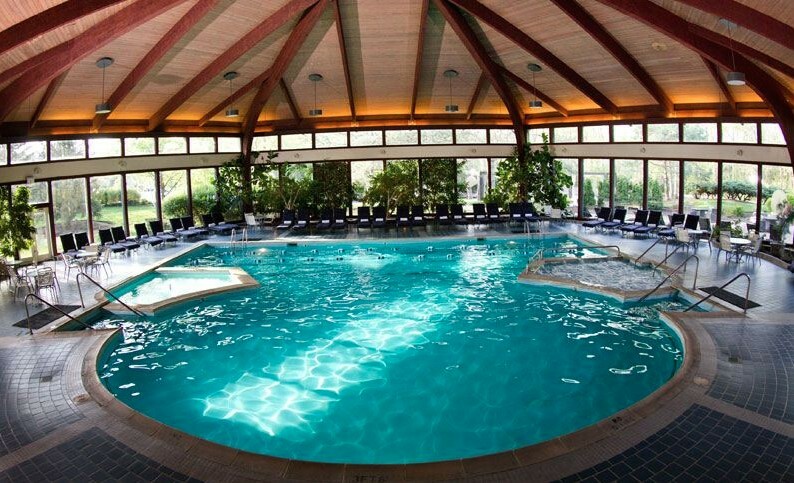 But what really sold us on the Abbey Spa was how nicely they connected their therapeutic treatments to the deeply calming design of the overall environment, especially in the culminating indoor atrium pool, ringed by windows, showing pastoral views of the grounds beyond. My wife loved it so much that, as I write this, she is planning a girlfriends’ getaway to return to the Abbey Spa later this summer. 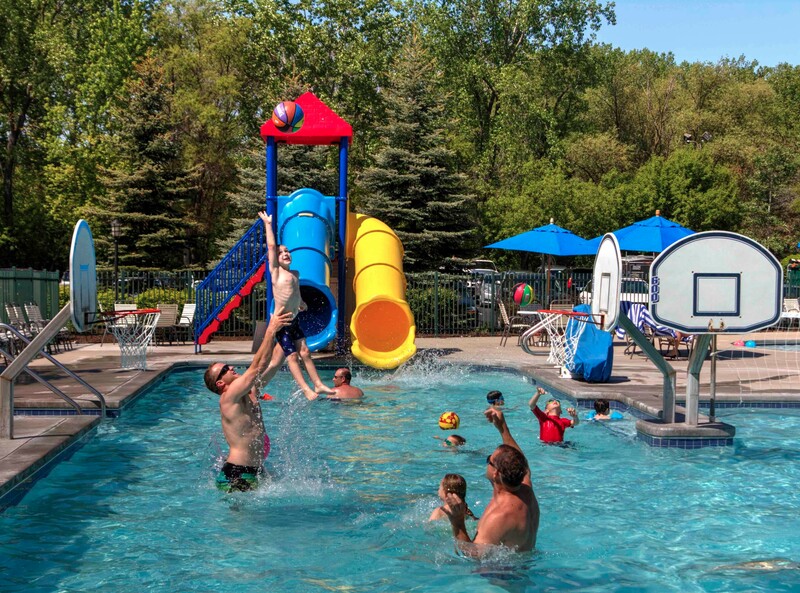 On the other side of the resort from the lake is a kid’s pool with waterpark-style attractions with a separate nearby adults-only pool for those that prefer to not have their sunbathing idyll sullied by cries of “CANNONBALL!” and the subsequent splashing that follows. If the weather turns for the worse, an indoor pool awaits, which also plays host to aquatic movie nights all through the year. There are also Discovery Day Camps for kids along with a variety of other childcare services, great for the little ones as well as for parents who might welcome a little solitary time on their own. If you forgot to bring your own boat, reasonable boat rentals are available at The Abbey, swimming, sailing, and there is, of course, the aforementioned fishing. There are some big ones out there, by the way, so if you’re sufficiently motivated to take a boat to the deeper sections of the lake, you could come home with a cooler full of sizable fish. While there, I saw one returning boating party, giddy with success, hauling some enviable trophies onto the dock. Part of the pleasure of visiting Lake Geneva is just enjoying the strollable lakeside paths and small-town streets of the city of Lake Geneva itself. The town is a quaint collection of shops and restaurants, with many worthwhile local activities, and makes for a nice afternoon of window-shopping and whiling away an hour at a coffee shop or wine bar. 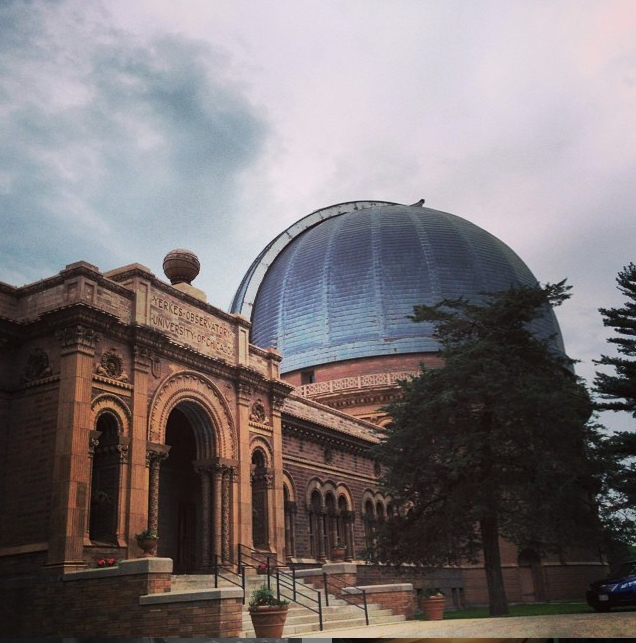 Walk a bit father along to nearby Williams Bay and take a tour of the Yerkes Observatory featuring the Yerkes telescope that thrilled visitors to the Chicago World’s Columbian Exposition of 1893, and remains the world’s largest refracting telescope. The ornately decorated building is by noted architect Henry Ives Cobb who also designed structures for the Exposition, the University of Chicago, and many other nationally recognized buildings in Chicago and New York. The observatory is a trove of astronomical history, fascinating for adults and kids, too — our internet-age son loved it. If possible, take the tour of the building offered by Richard Dreiser, a hilariously arch and encyclopedically informed tour guide who is worth the price of admission all by himself. The observatory is open to the public from 9:45 am to 1:30 pm every Saturday. Guided group tours begin at 10:15 a.m., 11:15 a.m., and 12:15 p.m. and last about 45 to 50 minutes. Admission is free, but they suggest a donation of eight dollars — a bargain. 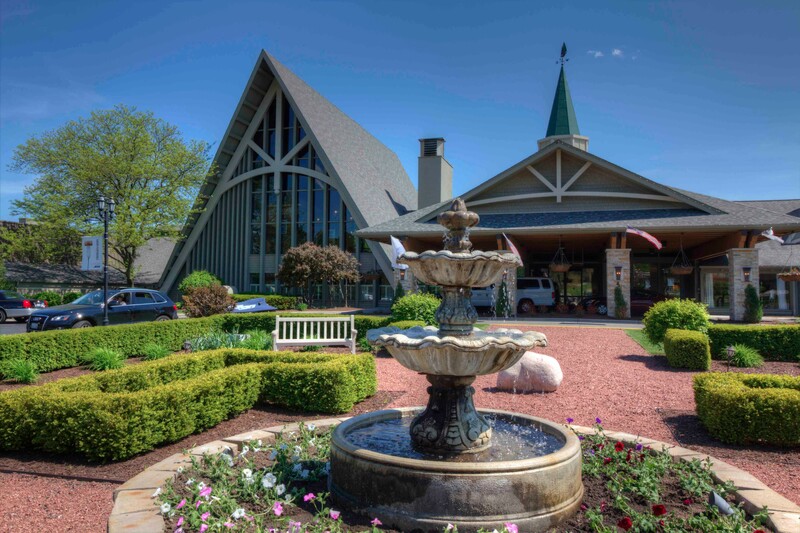 While the Lake Geneva area boasts a wide range of fun places to eat—from upscale to flip-flop casual—the Abbey provides such a variety of great food and drink options that we never had the desire to look beyond their doors when it came to mealtimes. Caffe Latte coffee shop is just on your left as you enter the Abbey, with hot and cold drinks, pastries, sandwiches and frozen treats, handy if you’re grabbing something quick on your way to the next new adventure. If you want to keep it casual at any time of day, make your way to The Waterfront Cafe, right off the docks where the boats put in. Outside you’ll see cooks manning the hulking outdoor smoker and laying out some beautiful slabs of ribs, chicken and steaks. The house sauce, Whiteford’s Signature Barbecue, is outstanding, so good that we were moved to snap up a few bottles to take home with us. The new Bar West keeps night owls entertained into the wee hours with small plates, cocktails and live entertainment. 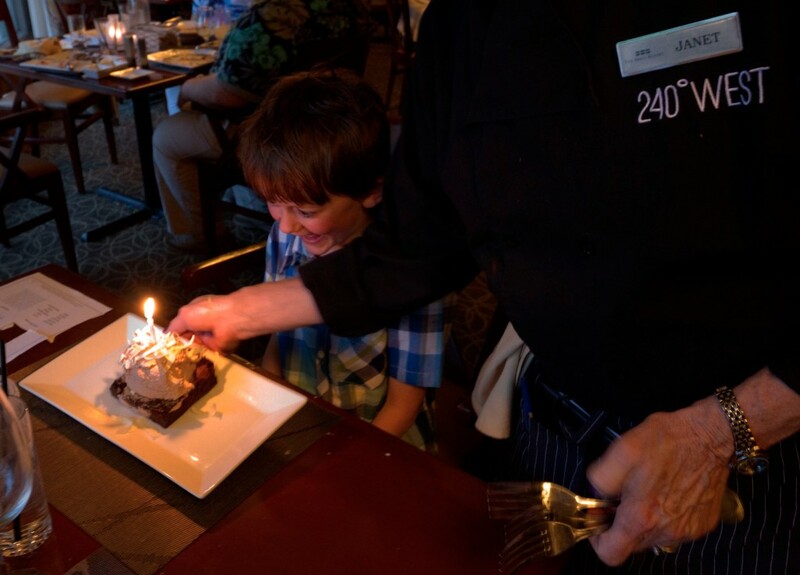 But whatever you do, make sure you have dinner at 240° West at least once — maybe twice. With those airy high ceilings veined with reclaimed wood beams, a towering flagstone fireplace that glows bright in all seasons, and with wide windows that look out on the boat-bobbing harbor, this is a lovely place to watch the day fade gradually into evening. Why do we like the Abbey so much? Sometimes it’s hard to put your finger on exactly why some places resonate with you and others somehow miss the mark. Maybe if you’ve been around for more than half a century, as the Abbey has, and hosted thousands of joyful wedding parties, romantic evenings, weekend getaways, and family reunions — all of those little magic moments of connection — then maybe all of that love and gratitude just gets incorporated into the substance of the place itself, and you can’t help but feel the gentle glow surrounding it, generously enveloping you, when you visit. Don’t miss our slideshow of The Abbey Resort & Avani Spa on Lake Geneva.